“Echoes of the Jungle” my first large painting, borrowed back for this exhibit. “Echoes of the Jungle” detail. From May through July in 2008, I frequently went to the Museum of Contemporary Art Detroit. I lived in the area and could even walk there from my house. It was nearly an hour walk but I’d walk it. Sometimes I’d get there on the bus and walk home. It was fun to talk about my work with any visitors who’d appear. I knew that this was a unique experience. It was yet another personal autonomous zone, a sort of temporary/ provisional utopia. An early wood sculpture and a metal wire sculpture. Besides just hanging out there, I also got to do a few special performances. I did a puppet show. The Spaceband got to do a show there as well. The Spaceband were camped out in a makeshift Pup Tent. We emerged to play a wild concert, including a light show. I think it was a 6 or 7 piece band. It was a lot of fun, having this large exhibit and getting my work out there for people to see. It was a lot of work too but I threw myself into it. 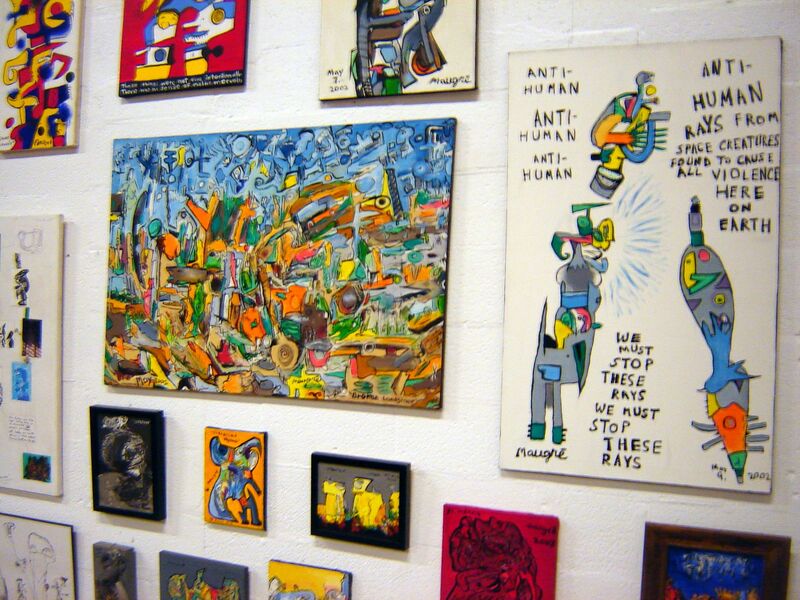 * Besides myself, the show included the late poet Jim Gustafson, the artist’s collective TIME STEREO, longtime Detroit painters Allie McGhee and Gordon Newton, then too artists Ellen Cantor and Heather McGill. I’d punch the time-clock, in and out, when I visited. You are currently browsing the for art and artists blog archives for June, 2018.